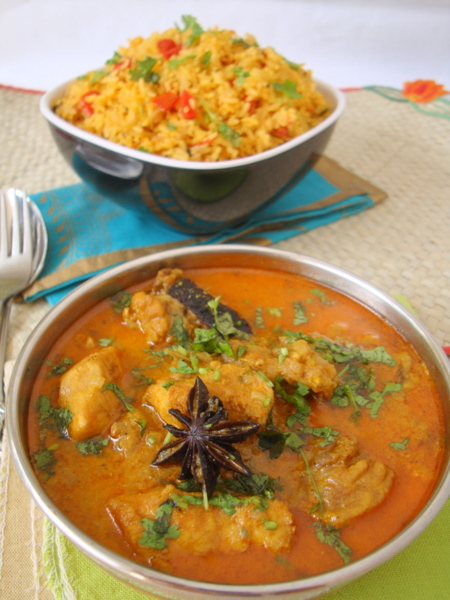 A fantastic and flavorful chicken curry that is a regular at our home. 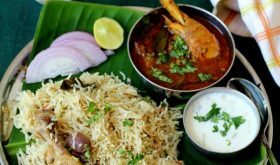 This favorite chicken curry recipe is usually prepared as a side with flavored rice like Tomato Pulao. Coconut milk and poppy seeds are essential in the preparation of the curry. The chicken simmers in a concoction of yogurt, coconut milk, poppy seeds and garam masala to yield a rich creamy textured curry. Tomato Pulao with Chicken curry made for a deliciously comforting meal. Marinate the chicken in yogurt, coriander pwd, cumin pwd, turmeric pwd, lemon juice and half of the ground ginger-garlic-green chili paste for 10 mts. Heat oil in a cooking vessel, add the star anise, cinnamon stick and chopped onions and fry for 4 mts. Add the remaining ground ginger-garlic-green chili paste and saute for 4 mts. Add red chili powder and mix. Add the marinated chicken and cook on high heat for 4 mts, mixing once in a while. Reduce to medium heat, add salt and poppy seeds paste and mix well. Let the chicken cook in this paste for 8-10 mts, uncovered. Cook till oil separates. Add 1 1/2 cups water and mix. Bring to a boil, reduce flame and cook for 13-14 mts. Finally add garam masala pwd, mix well. Add thick coconut milk and cook on medium flame for 3-4 mts. Turn off heat and garnish with fresh coriander leaves. 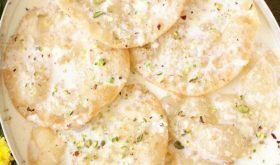 Serve hot with white steamed rice, coconut rice, any flavored or rotis. You can add 4-5 tbsps coconut paste instead of coconut milk. Add the coconut paste at the time of adding the poppy seeds paste. By Sailu Published: December 5, 2011 A fantastic and flavorful chicken curry that is a regular at our home. 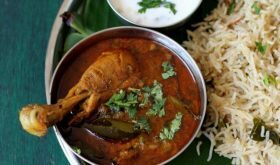 This favorite chicken curry recipe is usually prepared as a side with flavored rice like Tomato Pulao. Coconut milk and poppy seeds are essential in the preparation of the curry. The chicken simmers in a concoction of yogurt, coconut milk, poppy seeds and garam masala to yield a rich creamy textured curry. Sailu: One quick Q .. Do you recommend chicken with /without bone for this recipe? what is a substitue for poppy seeds? You can use melon seeds (called magaz in Hindi). 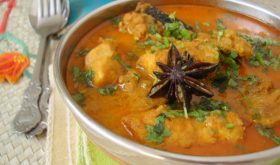 Chicken curry is the most easy and popular dish. I liked the idea of using star anise and coconut milk. Super delicious looking and i move that gravy it has. 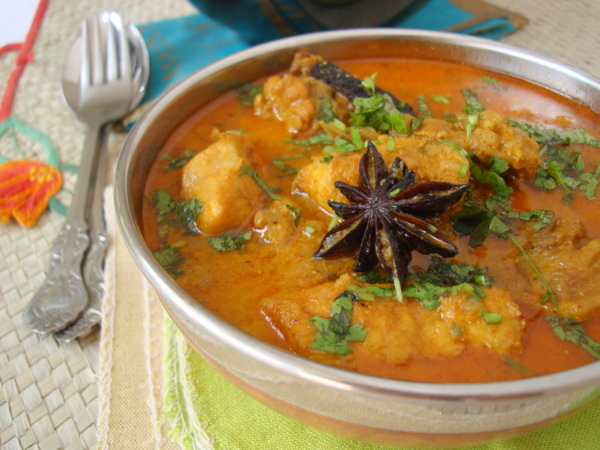 Super delicious chicken curry, wat an aromatic dish. You can try soy nuggets/meal maker and paneer. You can try mixed vegetables. If using mixed vegetables, do not marinate the raw vegetables. Saute the vegetables in 1/2 tbsp oil for 4 mts and then marinate for a 5-10 mts. Carrots, beans, caulflower, peas, potatoes can be used. Looks awesome… Love the new layout!! it is an easy dish with very few ingredients, but u have not mentioned red powder and its quantity in the list of ingredients. I have updated the recipe. Use 1 1/2 tsp of red chili powder. Wow. There is so much variation in chicken curry. One can add different ingredients to it, add different spices to it. The flavour is so different with different combinations. I love making it and experimenting with its taste and flavour. i love your recipes. 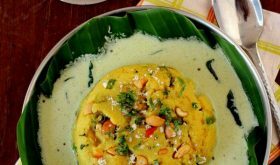 More than that you bring back memories of home with your colorful description of Andhra Pradesh as well the recipes. I am a huge fan and admirer of yours. Keep up the good work. Thanks alot.. first time in my life…i cooked very tasty chicken curry…:) thanks again. hey. tried this one today and everyone loved it! thanks! On step four, after you bring to a boil, do you cover before cooking 13-14 mins? How high is the flame for this period? Made today. I would not add any water, just use a can of coconut milk. Found it too runny with the water, I let it simmer for 45 mins and it was still too runny. Added another 1/4 cup of greek yogurht to thicken a little. Used 4 serrano peppers 8 cloves of garlic and a good 1.5″ giinger for the paste. I thought it would have more kick, but to my surprise this recipe is mild…next time I will increase the serrano peppers. All in all the taste was wonderful, just not hot enough for our taste. hello, i just tried this recipe and still on the burner. looks and tastes yummy. thank you. I have a chicken curry with coconut milk recipe on the blog. I have never heard of banana in chicken curry. Hi! My husband and I loved this dish. But I was wondering how u get the red/brownish color? Ours looked white/ greenish and black poppy seeds….Btw how do u make a poppy seed paste? I have diffrent tools but find it difficult to make a paste with a small amount of ingredients…..
We have a red, handwritten notebook which is reserved for our most beloved recipes – and I have just added this recipe which we prepared tonight and enjoyed tremendously. Thank you! I am based in the UK and am generally very disappointed how bland most cookbook recipes taste. But this recipe is a complete knock out. Unbelievable. Thank you. I made this one the second time. I like it a lot. It is not a tradition in Slovakia to cook Indian food but I am huge fan and love cooking. Thanks a lot!!! 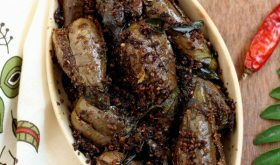 I made this today along with the veg pulao recipe on this site and it was a fantastic combination! Thanks again Sailu for such an awesome recipe! Chicken curry is a popular dish at home. Great recipe and good photos too. The recipe is looking spicy and hot. I’m going to try this in the weekend. How much should have been? In here i see a mix of ingredients for it, but i haven`t found the cardamom, instead i found “directly” garam masala powder. I put one full tablespoon (also, i had 1.5 kg of chicken). Was it too much, or less? Hi. I’d like to make this delicious chicken curry, but can I use lite coconut milk instead of thick ? Made this tonight, here in austin tx, there are only a couple indian stores to choose from but i found most of the ingredients and used a chinna marsala pack that had the rest. This is delicious!! Can i add cashew paste instead of poppy seed paste..my fanily doesnt like poppy seeds..
What kind of coconut milk did you use?Canned or freshly squeezed coconut milk .